CA Proposition 65 (Prop 65) is a major concern for brands that will heavily influence California’s consumer product regulations. All manufacturers, distributors, and retailers that sell or distribute consumer products in California will be required to comply with the state’s new warning requirement regulations—meaning your compliance with product testing standards has to extend beyond California borders. These new regulations, implemented under California’s Safe Drinking Water and Toxic Enforcement Act, are intended to manage liability risks by requiring warnings on products and premises that can potentially expose consumers to any of the 900+ specified chemicals. The new regulations will come into effect on August 30, 2018, making a risk and quality management solution increasingly important for your organization. Inclusive of online sales, product manufacturers, retailers, distributors, business owners, and property managers must evaluate all of their product lines or premises to ensure they comply. This encompasses a vast range of products and properties from dietary supplements to Disneyland Resorts (as pictured). The list of chemicals, which is updated annually, includes ingredients in pesticides, household products, drugs, dyes, solvents and some foods. Once a new chemical is added to the list, warning requirements will take full effect 12 months after the date it was added. In terms of property, these chemicals may be used in manufacturing, construction or are the byproduct of a chemical process (e.g. car exhaust). As of December 2017, there were upwards of 900 chemicals listed. WARNING: is required in both capitalized text and in a pictogram to indicate that a potential hazard is present. Chemical: labels must identify at least one of the present chemicals by name. Endpoint Exposure: either “cancer,” “reproductive harm,” or both must be communicated relative to the chemical. Label Placement: the warning must be placed directly on the product in an adhesive label form or inserted into the product packaging. 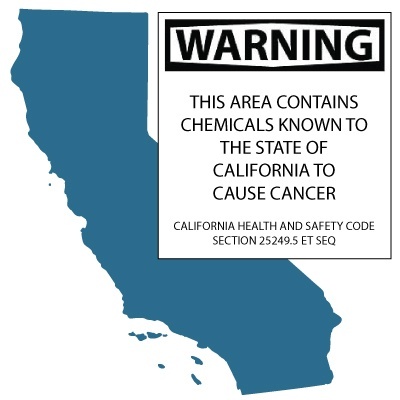 Learn More: labels will provide a link to the Office of Environmental Health Hazard Assessment (OEHHA)’s new Proposition 65 warnings website so consumers can learn more regarding the chemical and potential exposure risks: https://www.p65warnings.ca.gov/. The label requirement is determined based on a specified threshold level. If the chemical’s exposure level is too low to present significant risks or cancer, birth defects or reproductive hard, a label isn’t required. Additional Prop 65 exemptions include: government agencies and public water utilities, businesses with nine or fewer employees, and listed chemicals that occur naturally in foods. According to the official Prop 65 Warnings site, the regulation does not require businesses to use the new warning system in order to comply with the law. Instead, these labels simply protect businesses from Proposition 65 enforcement actions. The regulations will be enforced by the California Attorney General’s Office but can be reported by any person to act in the public interest by filing a lawsuit (this can be done online). Violation penalties of Prop 65’s warning requirements can be as high as $2,500 per violation per day along with responsibility for attorney fees incurred by the prosecuting counsel. Numerous individual law suits have been filed against businesses, placing a heavy burden on small and large business alike as they contend with these allegations. Beyond revising your company’s warning protocols, it’s time to assess your raw materials, vendor compliance, and risk mitigation strategies. No organization can afford allegation settlements but at the same time, many companies struggle to approve the cost of a global trade management solution. Whether you sell, distribute, or are located within California, it’s time to evaluate your company’s product compliance programs and explore the risk management solutions that can ensure you steer clear of encountering Prop 65 violations. Cloud-based platforms like Amber Road’s solutions provide visibility from the time a product is conceived to the time it is delivered—whether that be in California or anywhere else on the globe. The Inbound Logistics’ article Let’s Get Visible explores the decision-making process companies make when selecting technological solutions to improve their supply chain visibility. Stephanie Miles, Senior Vice President of Commercial Services for Amber Road, weighs in: "In order for companies to have a great supply chain visibility solution, they need to know what they're going after in the first place." Key considerations for global manufacturers, distributors, and retailers include improving supply chain transparency, minimizing corporate risks, and ensuring quality standards from end-to-end of the supply chain. If your company sources or manufactures overseas, and chances are you do, it is critical your vigilance extends to these entities. In many cases chemical regulations in other countries are less stringent than within the United States, making it easy to lose sight of your product components. In light of Prop 65, effective management requires transparency all the way down to the sourcing level. Amber Road’s Risk and Quality Management solutions help global companies accurately ensure that all trading partners are in compliance with regulatory requirements and standards for product safety, ethical sourcing of labor, health and safety and product quality. As a part of Amber Road’s Risk and Quality Management solution, Supplier & Product Traceability minimizes the risks associated with regulatory compliance. The solution streamlines supplier documentation and template workflows to support California SB 657 (California Transparency in Supply Chains Act), supplier verification and required record-keeping removing risk of Prop 65 violation. The only way to clearly and effectively communicate the potential hazards of your product is to have the facts. Download Amber Road’s Risk and Quality Management solution brochure to learn more.